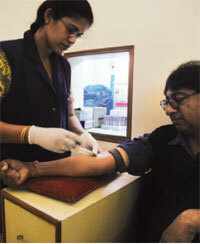 A BLOOD test is a convenient way to diagnose diseases. For example, if haemoglobin levels in the red blood cells are low, the person is anaemic. The story, however, does not end with a needle prick. It is a person’s genes that have all the answers. A series of studies has traced genetic markers that control the blood and can also be used to identify various diseases. One team looked at the genetic variations that control factors such as haemoglobin levels, red and white blood cell counts and platelet count and volume. The team found that the variant of a gene that controls platelet counts increases the risk of heart diseases. The variant, 12q24, was found in a region of the genome notorious for increasing risks of hypertension and type 1 diabetes. Another group studied the gene TMPRSS6 that controls haemoglobin (Hb) levels. Abnormally high levels have been linked to strokes. A mutated variant of TMPRSS6 can highly increase or decrease the Hb levels influencing the body’s iron status. “This finding may provide insight into genetics of diseases related to iron imbalance such as anaemia and hemochromatosis,” said Beben Benyamin, a participating scientist from the Queensland Institute of Medical Research in Australia. Hemochromatosis is a condition where there is an overload of iron in the body. “The protein produced by the TMPRSS6 gene is a good target for drug development. A drug that enhances the activity of TMPRSS6 could augment Hb production in cancer and kidney failure patients who have chronically low levels,” said John Chambers, from the Department of Epidemiology and Public Health at Imperial College London and a participating scientist. Diagnosing diseases would now be a two-step process: the blood count would provide the clue and the associated gene variant would be the target. Carried out by the HaemGen consortium, the studies were published in the October issue of Nature Genetics.